Liverpool played host to Bolton for the first game of the New Year and the 2-1 win – thanks largely to a moment of brilliance from Steven Gerrard and Fernando Torres – gave Liverpool supporters something to smile about. As long as they didn’t look too closely at the league table that is. Gerrard was only on the field because of an injury to Meireles. The captain was on the bench at kick-off after – in manager Roy Hodgson’s words – he’d been left “extremely tired” from playing the full 90 minutes of his first game back from injury on Wednesday. That tiredness meant Liverpool started with Dirk Kuyt on the right instead of out of position on the left, with Meireles starting in his natural role in the middle of the park. Gerrard was a straight swap for Meireles so nobody had to move out of position when the change was made. Two other changes gave Liverpool a different look to Wednesday; Konchesky was replaced by Aurelio and Daniel Agger was back in the side in place of Kyrgiakos. 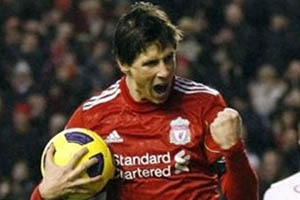 Liverpool’s equaliser came after Gerrard played a perfect ball to Torres, which Torres despatched perfectly into the back of the net before picking it up as he celebrated in front of the bouncing Kop. It served as a reminder of how much Liverpool have come to rely on the two players. Liverpool continued to attack and Bolton continued to hang on. As the minutes ticked down it looked like it was going to end in a draw. But two minutes into injury time Liverpool got what some will say was a lucky break, Joe Cole scoring his first league goal since joining the Reds in summer amidst claims of offside. The goal stood because the officials ruled the ball had touched a Bolton defender before reaching Cole. Liverpool had all three points in the bag. It was a huge relief to players and fans alike. He also seemed determined to get across exactly what he now felt was to blame for the shameful defeat to bottom club Wolves on Wednesday: “I was very anxious today that the team would put behind them the counter-performance of Wednesday night when we didn’t play anywhere near what we’re capable of playing and today was quite the reverse. Although it’s good to hear him actually admit to making an error (well, admitting he might have made an error), in the end it was just another way of getting his excuses in. Strange to hear Roy blame that defeat on the two-and-a-half week break from football just ten days after he said this: “I don’t understand the opposition to the winter break. I am a fan of a winter break because I think people need a break from the intensity that English football brings. “The beauty of the winter break is that you have this nice flow to your season. When players are just beginning to get a little bit tired and everything is beginning to weigh down on them you get a month to free your head. Back to today’s game and although the Reds had gone in a goal down at the break he denied he faced any challenges with his half-time team talk: “No, not at all, because we played so well. “I mean it was an unfair half-time result, you know, on the basis of what had gone on on the field of play, if any team should have come in leading 1-0 it should have been us. “To come in 0-1 it seems to be one of those moments where you’ve taken a slap in the face that you don’t deserve but my message to the players was, quite simply, that the way we were playing had got to continue; you’ve got to keep believing, you’ve got to keep faith in yourselves quite frankly, and go out and do that performance again in the second half. Roy messed up in a big way after that defeat on Wednesday with comments that suggested he was unhappy with the Liverpool fans, making a distinction between fan and supporter and claiming he’d not had enough support. Roy may want to put that little bottle of champagne back in the mini-bar; there shouldn’t be “great satisfaction” in beating a side that was so short on players it was only able to name four out of the permitted seven subs, a club that hadn’t won at Anfield since the fifties. It was a better performance, Owen Coyle has deservedly drawn a lot of praise for the improvements he’s made to the Bolton side, but Liverpool shouldn’t have been relying on a moment of brilliance from two of the club’s best players and a late, possibly offside, goal to get the three points. It emerged yesterday that Fenway Sports Group (FSG, formerly NESV) were now actively seeking a new manager and that the change would be made as soon as a suitable replacement was available. Hodgson was asked how he felt about the stories in the media about him: “Nothing you can do about it. I mean, the fact is that my job is to try and produce good performances and winning performances from the team. At some point earlier in the season he asked for fans to judge him after ten games. When the tenth game arrived and Liverpool were still doing far worse than they had in most fans’ living memories, the judgement didn’t look too good as far as the fans were concerned. This is the kind of talk that means there’s a platform waiting at Lime Street for Roy, one that will allow him to board the train to Euston with his suitcase and in turn allow Liverpool to move forward. Especially when they hear these words when looking at the league table: “That’s where we are and what’s more we’ve got two games in hand on most of the teams around us, so things are not as bleak or bad as maybe they looked on Wednesday night.” In fact Liverpool haven’t any games in hand on 19th placed Birmingham, who are just six points below Liverpool. And the team just below Liverpool, level on points, is newly-promoted Blackpool – and it’s Blackpool with a game in hand on Liverpool. Looking up to fourth placed Spurs the Reds do have a game in hand – but are a rather worrying 11 points behind. And there’s no game in hand on the league-leaders, who are now 16 points above Liverpool. That gap is just nine points short of what Liverpool have racked up all season. But did he have their support? “I guess so,” he guessed. He might be well advised to take it seriously. In the meantime he’s decided to blame the press for creating his negative press, rather than accepting that they’re just – finally – reporting the negativity that has been obvious to supporters throughout the season. He said: “I shall probably have to learn to accept I shall get a lot of brickbats. I take enough negativity from you guys [the press], today I am going to be quite blunt and I am not interested in anything negative. Talking as if the press are finding negativity that isn’t there suggests he has no plans to deal with the true causes. In fact he’s probably going to just try to ignore it: “That [negativity] is something I have to live with but it doesn’t affect me in my job because my job is to make certain the performance of the team today was the performance you saw. “I am going to be satisfied the team has given the performance I want, they want and the fans want and a happy evening is ahead.” Maybe that bottle of champagne won’t survive the night after all. If FSG are going to take their time finding the right manager they really need to spend some money on getting Roy trained to deal better with the media and with the public. Next up for Liverpool is a visit to Blackburn on Wednesday, the club who recently sacked Real Madrid hopeful Sam Allardyce (his hope, not theirs), the side who were hammered 3-0 against Sunderland today. After that it’s the FA Cup 3rd round against Manchester United as the games start to come thick and fast. At least Roy won’t have to worry about players having had too much resting time. The day before the World Cup Final – before Roy Hodgson had even met most of Liverpool’s players – I met Ray Lewington (presumably a close friend of Hodgson) at a party. He said that Hodgson had already decided he wouldn’t be able to do much at Liverpool and was prepared to be gone by Christmas with a nice pay-off. At the time, I dismissed Lewington’s opinion as idle speculation. Now I’m not so sure.